No More Tears®. 0% alcohol, dyes, sulphates. Enriched with silk extract. Leaves no unwanted residues behind. Hypoallergenic - formulated to minimise the risk of allergies. pH balanced. Active baby. Leaves skin soft, smooth, & feeling healthy. Paediatrician & dermatologist tested. Glides away 3x more mess* for silky smooth, healthy feeling skin *than cotton wool & water. Healthy Feeling Skin, Happy Baby. Between messy mealtimes and curious crawling, it's not easy keeping active babies clean. 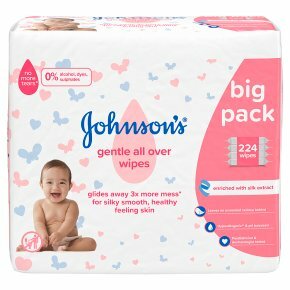 Our Gentle All Over wipes are designed to gently yet effectively clean tiny faces, feet, and everything in between. Cleanses without leaving behind any unwanted residue. Hypoallergenic**, paediatrician & dermatologist tested. With silk extract. Gentle enough to frequently clean delicate skin. pH balanced, leaves baby's skin soft & feeling healthy. **Formulated to minimise the risk of allergies.